Mumps rubulavirus is the causative agent of mumps, and is considered a viral infection. Characteristics include swelling of the parotid glands, salivary glands and other epithelial tissues. Symptoms of mumps are fatigue, body aches, headache, loss of appetite, low grade fever, swelling of the salivary glands. If not caught earlier, can also result in muscle pain, deafness, meningitis, swelling of testicles or ovaries, and death. Most people who contract mumps show symptoms of the virus, however there are few who show no or very few symptoms. Natural infection is currently restricted to humans and the virus is transmitted by direct contact, droplet spread, or contaminated objects. 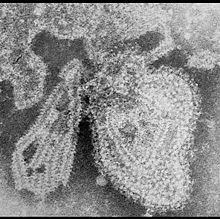 Electron microscopy (EM) revealed that the mumps virus (MuV), has an enveloped small infectious agents of roughly spherical shapes. Paramyxovirus particles can have sizes ranging from 120–450 nm in diameter. These particles consist of what is known as a ribonucleoprotein (RNP) complex: a single-stranded, linear RNA genome coated by nucleocapsid proteins (NP) in association with an RNA polymerase complex of both large (L) and phosphoprotein (P) sub units. It has been estimated that over 2,000 such NP molecules coat the genome along with about 250 P and 25 L molecules. This RNP structure interacts with the viral envelope via matrix (M) proteins that are evenly distributed around the virion. The envelope, a lipid bilayer derived from the host-cell plasma membrane, harbours multiple copies of a number of glycoproteins required for virus entry and exit: hemagglutinin-neuraminidase (HN), fusion (F), and the small hydrophobic (SH) protein. This molecular assembly of protein, RNA, and lipids allows a single virus to bind to and infect specific cells and replicate itself and finally exit the cell to be transmitted to the next susceptible host.The mumps virus can infect ependymal cells in the central nervous system. Although there is only one serotype of the mumps virus, there are currently 12 genotypes A-N, (namely A, B, C, D, F, G, H, I, J, K, L, N), The typing scheme is based on the sequence of the small hydrophobic (SH) gene. There is a new booster shot out now with the recent outbreaks, Apart from 2 doses of MMR vaccine, the following preventive measures to reduce the spread of infection. They include, Avoid direct contact with the person infected with mumps, Do not go to school/workplace until the infection is completely healed, Ensure to cover the nose and mouth while sneezing or coughing, Wash your hands thoroughly with water and soap. Several strains are used to vaccinate against mumps. These include the strains Jeryl Lynn, L-Zagreb, Leningrad-3 and Rubini and Urabe. Several strains are used to vaccinate against mumps, combination measles-mumps-rubella (MMR) given between 12-15 months old and measles-mumps-rubella-varicella (MMRV) vaccines given between the age 4 -6. Two doses of mumps vaccine are 88% (range 31% to 95%) effective at preventing the disease; one dose is 78% (range 49% to 91%) effective. most people experience no side effects from the vaccine. Some people experience a mild fever or rash or achy joints for a short time. There is a new booster shot out now with the recent outbreaks. ^ Tardieu M, Weiner HL (January 1982). "Viral receptors on isolated murine and human ependymal cells". Science. 215 (4531): 419–21. Bibcode:1982Sci...215..419T. doi:10.1126/science.6276976. PMID 6276976. "Mumps virus". NCBI Taxonomy Browser. 11161.